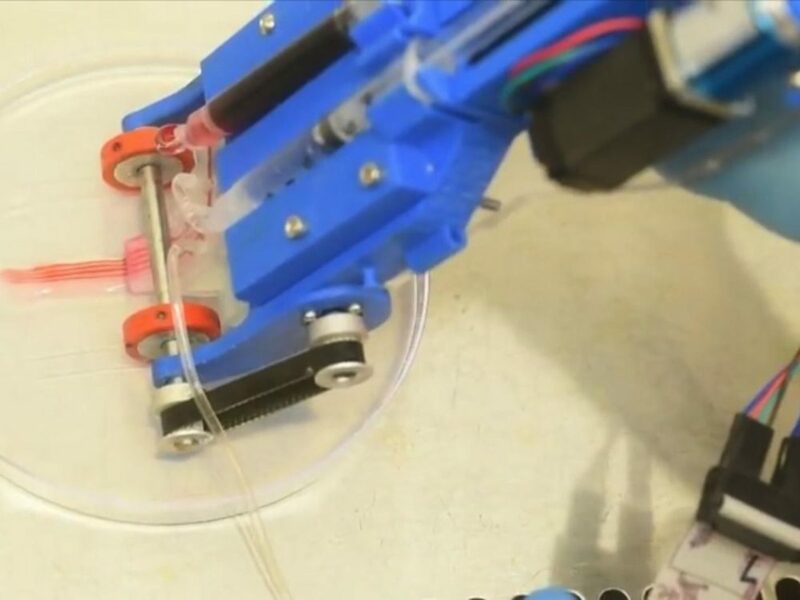 University of Toronto scientists have developed a portable 3D skin printer that prints layers of tissue to cover and heal deep wounds in minutes. The potential of this technology is life-saving. Deep wound patients may have heavy damage to all three layers of skin: epidermis, dermis and hypodermis. That can lead to hemorrhaging. This is the 1st 3D skin printer that deposits even layers of all three layers of tissue and improves the skin healing process. Currently, treatment for deep wound injuries involves skin grafting with healthy donor skin. This can require large amounts of healthy donor skin, which is not always available. As a result, sometimes a portion of the grafted area is left uncovered. At this time, most 3D bioprinters are bulky, expensive and work at low speeds. Current 3D printers are incompatible with clinical application, perhaps until now. The University of Toronto team has developed a hand-held skin printer that can overcome the problems of speed, expense and incompatibility. Most importantly it has clinical application for deep wound patients. It could revolutionize burn care. The next step is clinical trials.